Can policymaking keep pace with the social, technological, and environmental upheavals we are currently experiencing? 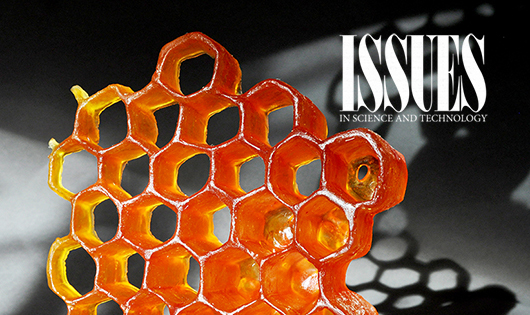 That question is central to several of the Feature essays in the Spring 2018 Issues in Science and Technology. The authors offer compelling policy proposals that can help society better manage these momentous changes. Brad Allenby and Mikhail Chester (“Reconceptualizing Infrastructure in the Anthropocene”) argue that the growing impact of human activities on all the Earth’s systems requires a concomitant change in the way we design and manage physical infrastructure. One way we manage the built environment is by insuring against losses, and Howard Kunreuther (“Reauthorizing the National Flood Insurance Program”) describes ways that Congress can make the imperiled National Flood Insurance Program more transparent, more cost-effective, more equitable, and more appealing to property owners. Data infrastructure can also be improved; Sallie Keller, Sarah Nusser, Stephanie Shipp, and Catherine E Woteki (“Helping Communities Use Data to Make Better Decisions”) outline a plan for helping communities—especially small and rural ones—take advantage of new techniques for collecting and analyzing data to better serve their residents. Improved education is important for helping citizens deal with change. Public universities are a vital component of the US innovation system and the nation’s most powerful engine of social mobility. But according to Shiri M. Breznitz and Martin Kenney (“Slouching Toward the Downton Abbey University System”), dwindling financial support and ever-increasing federal and state unfunded mandates are forcing public universities to take actions that undermine their effectiveness. Skills training is another key part of helping workers navigate technological and economic disruption. John Alic (“What We Mean When We Talk about Workforce Skills”) argues that a more integrated and systemic approach to training is needed to ensure a resilient workforce. If the necessary steps for addressing the plight of displaced and struggling workers aren’t taken, the nation risks the continued rise of reactionary populism. Michael Piore (“Economic Policy in the Time of Reactionary Populism”) explores economic policies that differ from both the Silicon Valley and the Washington economic paradigms in addressing these concerns. One of the most significant technological changes on the horizon may well be the deployment of autonomous vehicles. Jack Stilgoe (“We Need New Rules for Self-Driving Cars”) explains that we need new rules for self-driving cars that are flexible while ensuring that the vehicles are safe, broadly accessible, and avoid the worst unintended consequences. The algorithms being used in criminal justice are different from those of self-driving vehicles, but they can also have life-or-death consequences. Stephanie Wykstra (“What Is ‘Fair’? Algorithms in Criminal Justice”) looks at the tradeoffs involved in using these criminal justice algorithms to assess risk. With regard to another rapidly evolving technology, John J. Cohrssen and Henry I. Miller (“FDA Overreach on Genetically Engineered Animals”) warn against regulatory overreach that can stifle innovation in the genetic engineering of animals. In her review of Getting Risk Right: Understanding the Science of Elusive Health Risks by Geoffrey C. Kabat, Anne Fairbrother wonders how worried you should be about alarming headlines warning of health risks from everyday foods and products. Jane Maienschein casts a critical eye on A Crack in Creation: Gene Editing and the Unthinkable Power to Control Evolution, by Jennifer A. Doudna and Samuel H. Sternberg, the developers of a powerful new gene-editing technique called CRISPR. 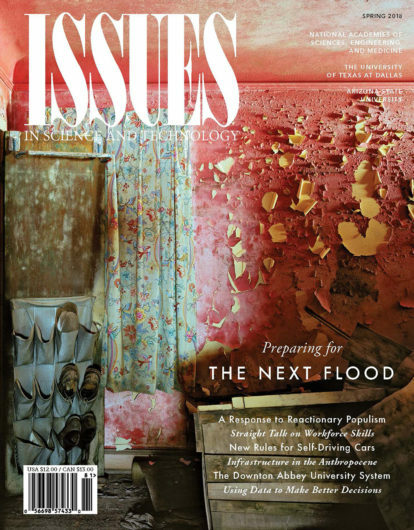 This issue also features artists exploring the Anthropocene in a variety of media and the powerful photographs of Robert Polidori, who recorded the devastation caused by Hurricane Katrina in 2005.